When: Thursday and Jan. 26-27. 7 p.m. Thursday and Jan. 26; 2 p.m. Jan. 27. Where: Gonzaga University, Wolff Auditorium at the Jepson Center, 502 E. Boone Ave. Cost: $10/general admission; $7/students and seniors. Full weekend: $28/general admission; $18/students. For tickets, call (509) 747-7394 or visit www.sajfs.org/our-programs/sjcff. After keeping track of the films garnering buzz from Jewish film festivals around the world, shortlisting nearly 20 of them, members of the Spokane Area Jewish Family Services board, community members and film buffs set to work narrowing the list to the top three. And after hours of watching, the schedule for the 15th annual Spokane Jewish Cultural Film Festival, Thursday and Jan. 26-27 at Gonzaga University, is set. Neal Schindler, director of Spokane Area Jewish Family Services, this year’s lineup is relatively upbeat compared to recent years’ festivals, a partially intentional choice. 87 minutes. English. Not rated but contains some strong language. The movie will be introduced by SAJFS board member and Hadassah Foundation chair Julie Morris. The festival opens with a documentary, directed by Seth Kramer, Daniel A. Miller and Jeremy Newberger, following the Israeli national baseball team as it competes in the 2017 World Baseball Classic, its first appearance in the tournament. Many of the players are Jewish-American major league athletes, few of whom have ever set foot in Israel. Ranked 41st in the world, the members of Team Israel must shake off their reputations as has-beens to represent the country while the whole world is watching. On the surface, Schindler said, “Heading Home” disproves the stereotype that Jewish people are not good athletes. On a deeper level though, it explores how going to Israel can change how Jewish people around the world who may not have a strong connection with the country see their Jewish identity. “The film depicts some of that identity building, and that is a big part of the Jewish experience for a lot of Americans,” Schindler said. The movie will be introduced by SAJFS board member and Hadassah Foundation chair Julie Morris. All attendees will be eligible for a drawing to win 2019 Spokane Indians tickets. 102 minutes. English and German with English subtitles. Not rated but contains some strong language, sexual situations and a disturbing image. “Bye Bye Germany” is set in Frankfurt in 1946. Having escaped the Nazi regime, David Bermann (Moritz Bleibtreu, “Run Lola Run”) and his Jewish friends, currently living in a displaced persons camp, want nothing more than to travel to America. In order to fund such a trip, the group begins to sell what Germans need most, fine bed linens. But as the money rolls in, so do questions about Bermann’s past. 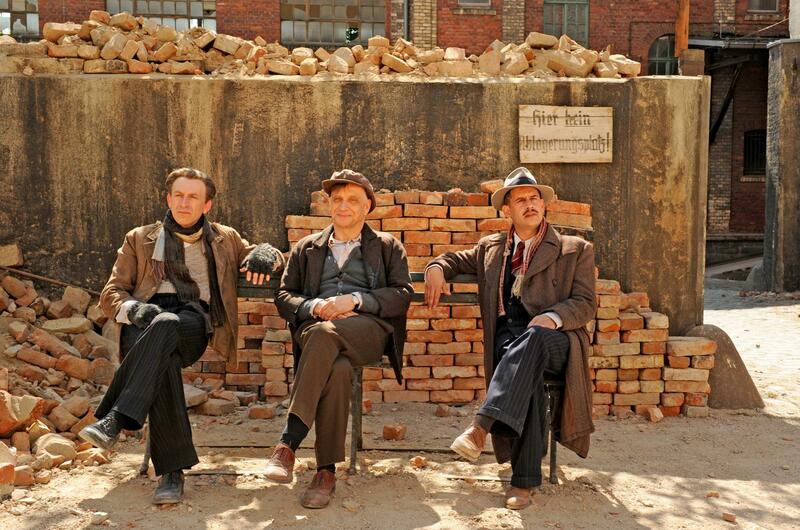 Schindler said “Bye Bye Germany” will inform viewers who don’t already know about the stories of the displaced persons camps while also celebrating the resourcefulness of those who lived in the camps. 102 minutes. Hebrew with English subtitles. Not rated but contains some mild innuendo. The festival closes on Jan. 27 with “Shoelaces,” directed by Jacob Goldwasser. “Shoelaces” follows Reuben (Doval’e Glickman) and his son Gadi (Nevo Kimchi), who has special needs and who he abandoned when Gadi was a child. Reuben’s kidneys are failing, and Gadi wants to donate one of his own to his father, but the transplant committee rejects his offer, claiming Reuben, as Gadi’s legal guardian, can’t authorize the procedure. But Gadi, who recently lost his mother, is afraid of losing his father too and decides to fight for his right to donate his kidney. In 2018, it was nominated for best picture at the Ophir Awards, also known as the Israeli Oscars. Glickman won the Ophir for best supporting actor, and Kimchi was nominated for best actor. Schindler said “Shoelaces” had the potential to come off as “a saccharine movie of the week” but that the performances from Glickman and Kimchi keep the film grounded in reality. “One of the things I appreciate about the film without giving anything too big away is that it doesn’t take the easy path that we’re used to with films like this where everything is wrapped up in a neat bow at the end and the happy ending trumps all concerns for realism,” Schindler said. Published: Jan. 18, 2019, 8 a.m.